As I write this article this afternoon, I am sitting in a Starbucks Cafe in the Taw Hill area near Swindon, England (70 miles west of London). I'm here to visit friends after the Mediterranean sketching trip. It was a fun cruise and I think everyone in the party, ten--including myself, enjoyed themselves. This Starbucks is located upstairs inside a clothing shop, which used to be Borders. Everything looks and smells the same. I could be in Portland, if I didn't know any different. Well, maybe not, I think the English accents would give it away. Right, we are discussing the pigment yellow this month. The brightest color on the color wheel, yellow conjures up all sorts of images: happiness, optimism, enthusiasm, sunny days (oh where have they gone) and so on. Years ago, I worked for a group of psychologists, who wanted me to put together a brochure for them. But first they asked me to do a color study to decide what theme they wanted. It was a fascinating assignment, but hard as there wasn't much information available back then (way before the birth of the Internet). What I found was that red and yellow stimulate the nervous system. These colors can even dilate the eye, creating energy and excitement. Next time you go into a supermarket notice the package colors. There's a reason for all those yellows and reds. Knowing this, you can probably see why bright warm colors come forward in painting and cool colors seem to move backward. Ochres are among the earliest pigments used by mankind, derived from naturally tinted clay containing mineral oxides. Chemically, it is hydrated iron (III) oxide, mineralogically known as limonite. 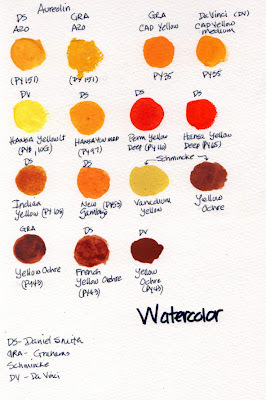 Modern artists' pigments continue to use the terms "yellow ochre" and "red ochre" for specific hues. More than 75,000 years ago humans were using yellow orche (also known as Mars yellow) in their caves in South Africa to illustrate their lives. While this pigment created a somewhat dark yellow, it wasn't (and still isn't) very brilliant. In fact, it's quite earthy. 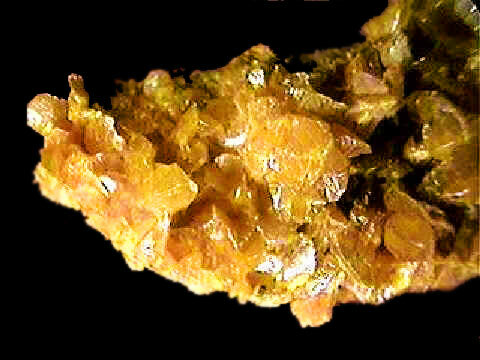 To develop a more brilliant color, ancients used a highly-toxic mineral called orpiment, which was in use up to the 19the century. 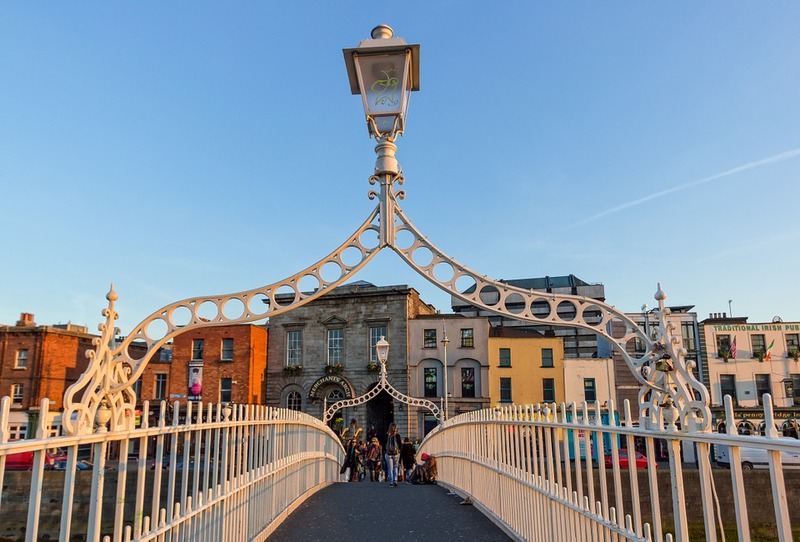 During the Middle Ages, Europeans used lead tin yellow, but again this was highly toxic. Then from India came a better yellow called Indian Yellow. Unfortunately, the pigment came from the urine of cows who were forced fed mango leaves--outlawed in the 1920s by the Indian government. 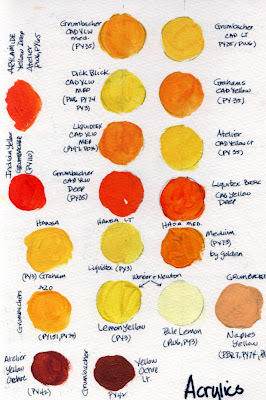 As with the other pigments we've studied so far, it was chemistry that really expanded the yellow pigment. Naples yellow is considered one of the oldest synthetic pigments, but is highly toxic and is today created by several different mixtures. Are you getting this theme here that earlier pigments usually ended up being found to be toxic. I wonder how artists managed to live through it all. The mid-19th century saw the birth of lemon yellow, cadmium yellow and chrome yellow. Of the three, only lemon yellow was not found to be toxic. Cad yellow and chrome yellow have been replaced by other yellows. In particular, cad yellow is being replace by Azo, also known as arylide or Hansa Yellow. Gamboge is a orange-yellow that was originally form Cambodia and was used in the far east since the 8th century. It's been used by the West since the 1600s. And believe it or not, is not considered toxic! 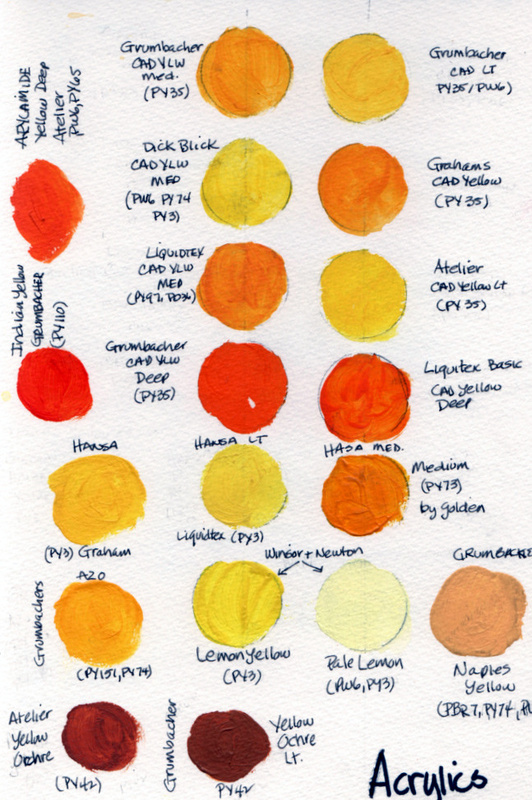 I learned a lot from creating my own yellow paint chart this past month, learning that yellow can range from warm (more red) to very cool (a greenish yellow). It's been fun to take my own paints to see what I have in my arsenal for future paintings. Below are the scans from my color book. Unfortunately, colors don't exactly match what are in my book, but they're close. What amazes me is how brownish yellow orche can get and how orangey other colors can be as well. 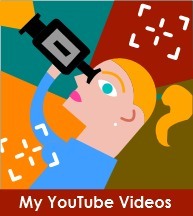 What will you chart look like?? Next month, I'll cover earth colors, black and white.